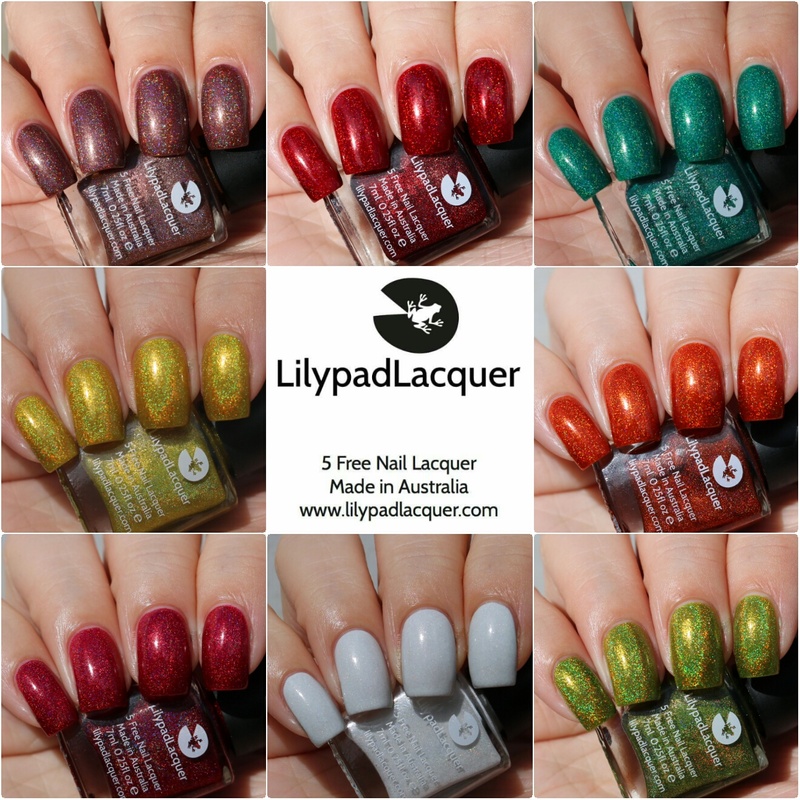 Melbourne has finally decided to give me some sunshine so I am finally able to share some more the new releases from Lilypad Lacquer. I still have another seven polishes to swatch so fingers crossed I get some more sunshine soon. Today I have eight polishes to share with you so this post is going to be quite picture heavy so I will keep the chatting to a minimum. All pictures are taking both in direct sunlight and in natural lighting (with the exception of one which was done in my light box as it was more colour accurate in there) and all swatches are done without top coat. I will pop a link to parts one, two and three at the bottom of this post. 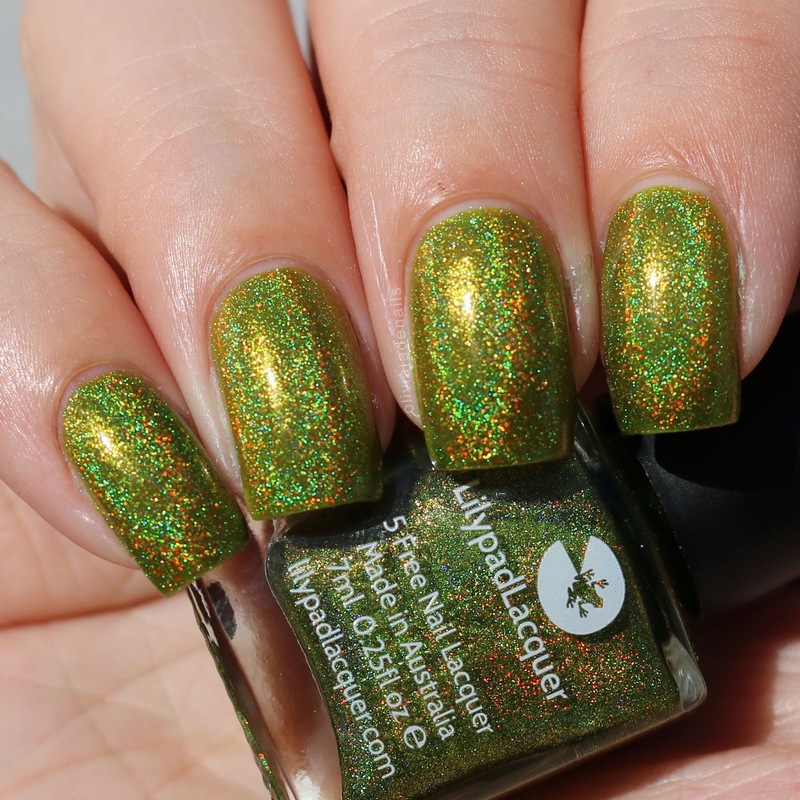 Calypso is a lime based chartreuse holo. This one applies evenly, although is quite sheer in colour. I used three coats for my swatch. 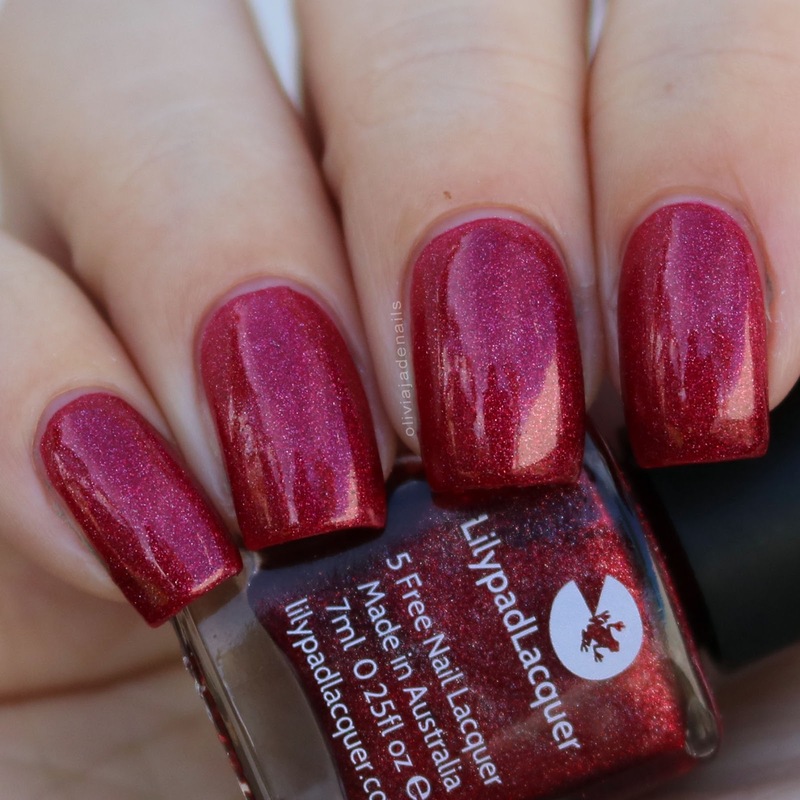 Cranberry Pop is a cranberry red holo. The formula is great and easy to use. My swatch shows two coats. Furnace is a rusty orange holo. Again this one is easy to use. I used two coats for my swatch. Galliano is a bright yellow holo. Now this one is very sheer. I used four coats for my swatch and still have a visible nail line. I would definitely wear a base colour with this polish next time. Ghost is a white holo. I quite like the colour of this one. While it does apply unevenly on the first coat, it did even out on the second. My swatch shows two coats. 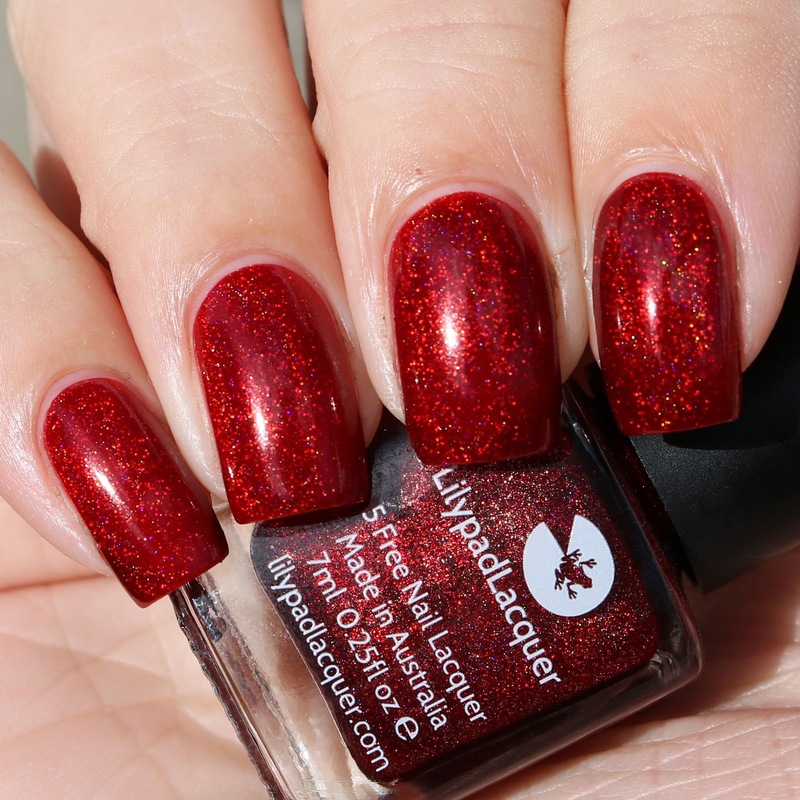 Hearts And Daggers is a rich red holo. Easy to use and does have a very slight visible nail line at two coats (shown in my pictures). Lilypad is a blue based green with a golden hue. Such a pretty colour and great formula. This one for some strange reason wouldn't photograph accurate in natural lighting so I have included a light box picture of it instead. My swatch shows two coats. Mudpie is a mocha brown holo. This is another nice colour with a great formula. My swatch shows two coats. There are definitely some great colours in this months releases. My personal picks from the polishes I have shown you today are Ghost, Lilypad and Mudpie. 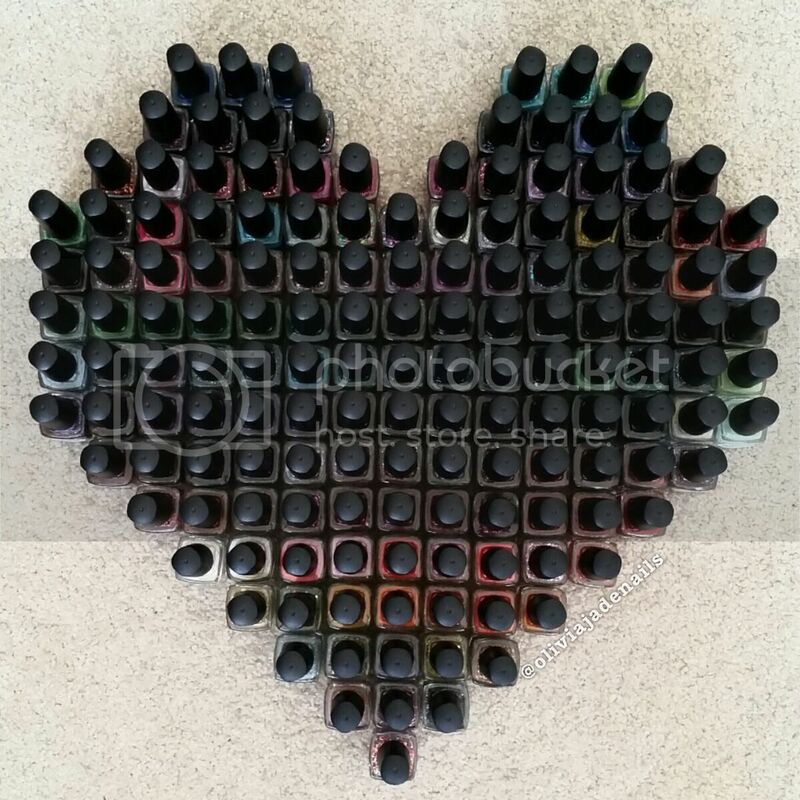 All of these polishes are available now from Lilypad Lacquer.